"The first thing that grabbed my attention with Emily's page was the main page, which is done in the spirit of the show's unique opening. Unlike other sites I've seen that just reuse images from the show, this site really strives to be original in its use of images. Yet, at the same time the content is kept simplistic in nature. I was also very thrilled to discover a slew of images that I personally hadn't seen before. There is also a well laid out series of character pages and CD guide that sports Real Audio versions of all the music tracks. The one section that isn't complete is the episode guide, but the miscellaneous section more than makes up for it with tons of scans and product info." "It's always nice to see a good effort put into a series site, and this site's no exception. Sometimes it seems that the only series that have real quality sites are really rare, obscure series, but every now and then you get surprised. Cowboy Bebop is one of those 'instant-classic' series, and it has a graphic style all its own--which, as a graphic designer, I'm a huge fan of. It presents a very edgy, almost industrial spirit yet it's always colorful and easy on the eyes. Emily's Cowbow Bebop Page does a not-bad job capturing that spirit... In fact, it seems to extend on that spirit into other directions, which makes the site all the more interesting to browse. Excellent work, Emily! ^_^"
"Great layout. It really grasps the feel of CB; it's style is quite like the covers artstyle for the series' DVDs and whanot. Information is cut and trim - - information given is relevant and substancial for anyone curious about the series. Media detail, Episode detail.. even Staff detail - - A very resourceful page, if I do say so myself." "Cowboy Bebop has a very definite style, which is unlike any other anime I've ever seen before. This site comes very close to capturing it. The images and overall design of the pages are admirable and worthy of such a series as Cowboy Bebop. However, I did find a couple of broken links, which is decidedly annoying. Emily has put quite a bit of information into her page; and, it's a good resource, covering nearly every aspect of Bebop, from character biographies to the manga. I hope to see information about the upcoming movie, as she is already doing such a good job documenting everything Cowboy Bebop. If I wanted to get very particular, I might complain about the color palette used in that it's a bit limiting. But that's really something quite small, and the site still remains true to Bebop style. I definitely recommend it for information!" "A very thorough website. I think there were like 2 broken links liks Other Characters and Misc. Series Info.. Other than that I liked the content. I also like how the layout goes well with the style of the series, that is probably the first time I have een a site to pull that off. Great page!" "Cowboy Bebop is one of the most popular anime series in recent memory, and for good reason. Its got more style per frame than anything else on the market. For those new to the series, or for fans looking for details on something you missed, Emily's Cowboy Bebop page is as good a reference as you'll find on the web. There's detailed information on the videos, characters, and especially the music (she has most of the soundtrack albums available to listen to, as well as links to buy). My only complaints with the site are minor. Some of the images are of low quality, the episode guide is still far from complete, and the caracter guide focuses on just the major characters. Also, I wish the site was a little more... jazzy. It's got more info than any other site, but for a fan who's seen the anime multiple time, the site doesn't offer much to keep you coming back. With the widespread popularity that Bebop has recieved in the past year, I hope Emily keeps improving her wonderful site." "Emily's Cowboy Bebop Page is among one of my favorites on one of my favorite series. In fact, it was one of the inspirations for one of my former home pages. 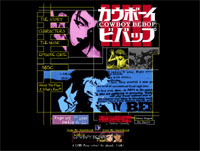 The site is among the most stylish about Cowboy Bebop and is filled with information. Unfortunately, it has been an eternity since the page has been updated. If you're looking for Cowboy Bebop information this is a good place to start."